Current promos: SUMMERDAYS – good for $9.15 COM/NET registrations, TELSOMEONE – good for $8.49 .TEL registrations! 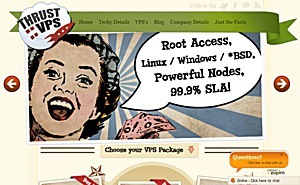 Now PhotonVPS direct link with China Telecom and offering this promotion for new users. Details for the following promo. 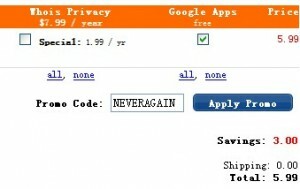 Name.com Super Awesome One Day $5.99 Sale! Starting now and running until 10PM MST (GMT -7), we will be having a Super Awesome One Day $5.99 sale! With the code NEVERAGAIN you can get $5.99 .COM & .NET registrations for today, and today only. This is possibly the last time you’ll see a deal this sweet, so you’ll have to act fast before the promo code expires at 10PM MST (GMT -7) tonight!